More than two years ago, I wrote an article detailing how I secured a garden pot to a metal post in our garden. It is a plastic rectangular pot that has a Plumbago auriculata. That was more than two years ago. The garden pot has faded and has weathered the elements. The Plumbago plant has matured and its branches has thickened considerably.. Shown below is the garden pot with the Plumbago auriculata inside. Upon closer inspection, you will notice that the level of the soil's surface is now shallow. At the time the Plumbago auriculata was planted in this garden pot more than two years ago, the surface of the soil was roughly one inch from the top of the garden pot rim. Now, the surface is about three inches from the top. What could have caused this seeming reduction of the potting soil contents? One possible explanation are bird dust baths. When the plant was still smaller and thinner, it's is possible that birds, mostly sparrows, would swoop down into the garden pot and perform a ritual known as dust baths. The dust baths entailed sprinkling and scattering the soil by the birds to themselves. 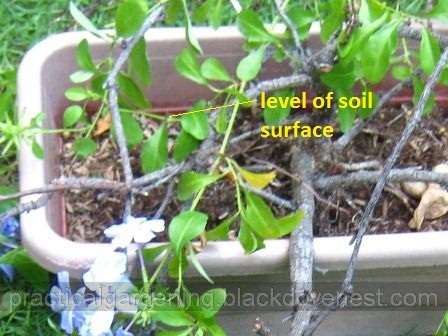 In this activity, some soil may likely be thrown out of the garden pot. I don't see birds doing that now. With the thicker branches, perhaps there is now little space in the garden pot to move around. Another possible explanation is the natural compacting of the soil through the years. Potting soil, especially in plastic garden pots, has a tendency to pull away from the sides of garden pot. Because soil pulls away from the sides there's a thin layer of space in between the soil and the pot's inside surface. When watering the plant, the soil has less chance of absorbing the water completely. Instead, water would flow down through this thin layer of space. This then goes out quickly through the drainage holes. The soil is now relatively compacted and hard. Attempts to cultivate the soil has temporary benefits because much of the soil is compacted. The plant has now grown considerably bigger. With the soil surface level diminished, some of the roots are showing. The procedure below adds new soil below the present compacted potted and not only on top. Prepare new soil or medium that will be added to the garden pot. Put this new soil in a bin.